Dr. Ali Sepehr discusses his technique for enhanced facial rejuvenation during facelift surgery and what patients should expect from the procedure. 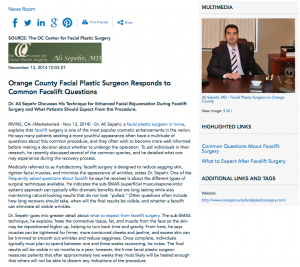 Irvine, CA — Dr. Ali Sepehr, a facial plastic surgeon in Irvine, explains that facelift surgery is one of the most popular cosmetic enhancements in the nation. He says many patients seeking a more youthful appearance often have a multitude of questions about this common procedure, and they often wish to become more well-informed before making a decision about whether to undergo the operation. To aid individuals in their research, he recently discussed several of the common queries, and he detailed what one may experience during the recovery process. Medically referred to as rhytidectomy, facelift surgery is designed to reduce sagging skin, tighten facial muscles, and minimize the appearance of wrinkles, states Dr. Sepehr. One of the frequently asked questions about facelift he says he receives is about the different types of surgical techniques available. He indicates the sub-SMAS (superficial musculoaponeurotic system) approach can typically offer dramatic benefits that are long lasting while also maintaining natural-looking results that do not look “pulled.” Other questions often include how long recovery should take, when will the final results be visible, and whether a facelift can eliminate all visible wrinkles. Dr. Sepehr goes into greater detail about what to expect from facelift surgery. The sub-SMAS technique, he explains, frees the connective tissue, fat, and muscle from the face so the skin may be repositioned higher up, helping to turn back time and gravity. From here, he says muscles can be tightened for firmer, more contoured cheeks and jawline, and excess skin can be trimmed to smooth out wrinkles and reduce sagginess. Once complete, individuals typically must plan to spend between one and three weeks recovering, he notes. The final results will be visible in six months to a year; however, the Irvine facial plastic surgeon reassures patients that after approximately two weeks they most likely will be healed enough that others will not be able to discern any indications of the procedure. Ultimately, Dr. Sepehr wishes to provide an abundance of information for individuals seeking a detailed resource on facelift surgery. He believes an educated patient will closely follow post-operative healing instructions, which are essential to optimize results, and report greater satisfaction with the outcome. With meticulous care, he asserts, benefits can last up to ten years. A fellowship-trained plastic surgeon, Dr. Sepehr began his career at the University of California, Los Angeles, where he received both his undergraduate degree in Biology and his medical degree. He then completed his surgical residencies at the University of California, Irvine in Head and Neck Surgery and Facial Plastic and Reconstructive Surgery. He has been published in numerous medical journals and is the recipient of several awards, including the Reuther Kris Conrad Merit Award in 2010. Dr. Sepehr is available for interview upon request. For more information about Dr. Sepehr and The OC Center for Facial Plastic Surgery, please visit orangecountyfacialplasticsurgery.com and facebook.com/ocfacialplastics.